~ Indian Dance, Theater and Poetry Summer Program is a 5 week camp for children ages 5 and above. Each session culminates in a stage performance by the students of this breathtaking 2000-year old epic. ~ The epic is introduced through story-telling, martial arts, yoga, mask-making, Sanskrit (the language of the epic), poetry, rangoli (floor painting) and creative writing. ~ The camp has been operating for nearly 30 years, with children returning year after year, first attending as junior campers and then later as camp counselors. ~ Each year the campers define the story in their own terms. Some write their own scripts, some redesign props, while others create mini-videos with their own twist on the classic. Monday through Friday, 9am to 4pm at Sutradhar Studios. Our Ramayana (free performance) is Friday July 19th 2019 - 1pm at the Margaret Schweinhaut Senior Center. 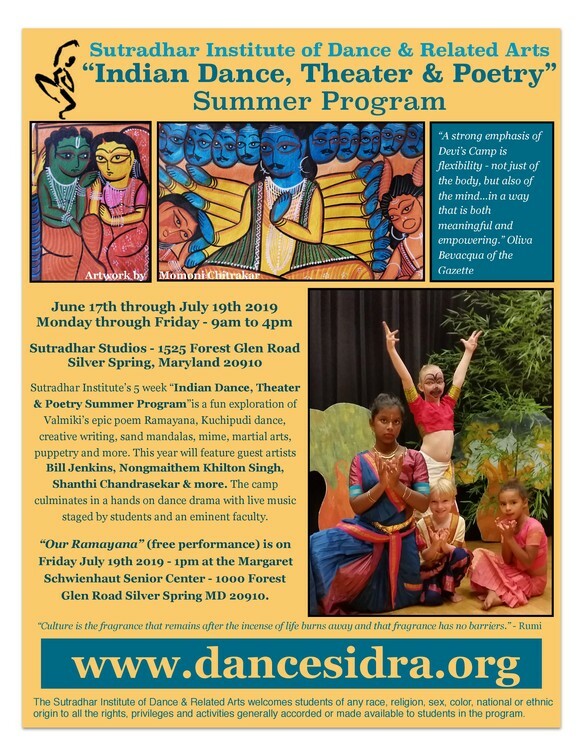 TO ENROLL ONLINE for Sutradhar's Indian Dance,Theater & Poetry Summer Program please complete the form on the lower right of this page and you have the option to pay via PayPal with the links below. During the summer program Sutradhar offers Before/After Care between the hours of 8am to 9am and 4pm to 6pm. This is $15 an hour. You have the option to pay for this through the PayPal link below.